Most of the houst will be "stick built" out of 2x4 and 2x6 construction lumber, but the ballroom will be built with a timber frame from Harmony Exchange (2700 Big Hill Rd., Boone, NC). Spectrum Homes has been working with Mark Howell and Dan Keiser (828-264-2314) for the plans and timber pieces we will be using. Erci actually designed the finials from pictures of surviving Tudor era timber frame buildings, and the timbers themselves will be made of Eastern Pine, laminated together, chamfored, and stained "Provincial" (dark) to look like old oak beams. I very much wanted the roof to look convincingly like a real slate roof. Unfortuneatly real slate is both prohibitively expensive (up to 15 times the cost of other roofs) and very heavy, requiring extra structural support. There are convincing slate-like roofing products that bear watching. A few of them are listed below. 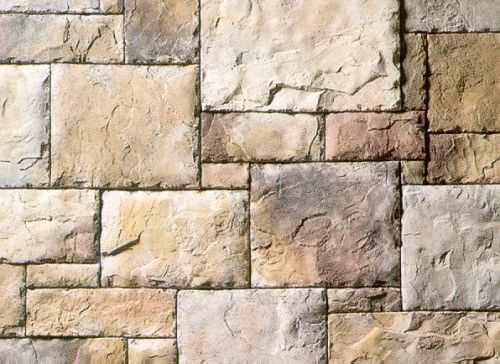 They make tiles that are very convincing, but the prices are just not quite low enough yet, and the labor costs of installing them are higher because more pieces takes more of a roofer's time. EcoStar's Majestic Slate and Euroslate environmentally friendly, nice looking... wish there was more info abot color choices... - they have rave reviews about less solar gain... perhaps we should look again? CertainTeed's Celadon Ceramic Slate line is exceptionally durable, with limited colors, it has a 60 year warranty. Owens Corning, MirroVista faux slate looks fabulous. GE Plastics, Perfect Choice "slate" roofing have some special fire retardand abilities. So we will use "architectural grade" 40 year asphalt shingles. Some of the lines we looked at are listed below, in my favourite order. I want to stay fairly light in color to minimize solar heat gain. GAF Materials Corporation's Slateline product looks pretty good, especially in the Slate Green Blend. GAF Materials Corporation's Country Estates product looks ok.
GAF Materials Corporation's Country Mansion product looks ok.
CertainTeed's Grand Manor Shangle line is exceptionally pretty, but at what price? Owens Corning's Oakridge 40 (Deep Shadow) line looks great, and they let you mix and match color palettes - Colonial Slate and Estate Gray look nice. Owens Corning also has MiraVista Copper roofing tiles with a 50 year warranty. eco-shake, nothing slate-like, but very envronmentally friendly and with a long warranty. Regardless of the materials used, Steve at Katchmark Construction will be the roofing contractor. Jess at Luckstone in Sterling is our supplier. Kitchen Fireplace: Weather Edge Ledgestone (Fox Valley), Cobblefield (Old Country or Ohio or Gray), or RiverRock (Lake Shore) on both interior and exterior of Kitchen fireplace/chimney. Stone Wall in Ballroom will be the same European Castle Stone (Bucks County) as on the outside of the "keep" of the house. Master Bedroom Chimney (exterior only) in Weather Edge Ledgestone (Fox Valley), Cobblefield (Old Country or Ohio or Gray), or RiverRock (Lake Shore) also. Cultured Stone European Castle Stone, Bucks County (PF-8213) color palette on all outside walls of the "keep" of the house, including the walls that are now inside (wall facing ballroom, wall facing mudroom). 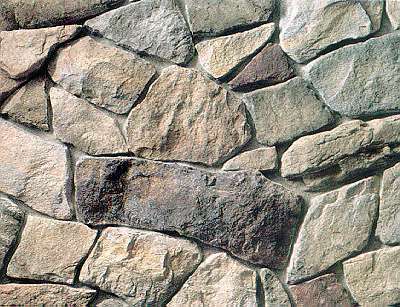 Cultured Stone Dressed Field Stone, Bucks County (CSV-2030) color palette for the basement walls and the foundation. In particular, the James Hardie site has "HardiPanel Stucco Vertical Siding" for the Tudor look (5/16" thick, 2.3 lbs/sq ft, 4'x8' or 4'x9' or 4'x10' sheets. Concrete Siding from CEM Plank or James Hardie (both are concrete fiberboard technologies). P.G. Awning Sunrooms (aka: Sunroom Designs of Annapolis) has a fascinating technology using vinyl glazed windows for easy stowing when you want air flow, they look decent and affordable too. Overhead Door Company has the Royal PVC Renata line which is interesting, ArmorTite safety lifting spring, Uni-hinges (quiet), and Ultra-Glide Ring Clips instead of Wheels (silent). http://www.raynor.com/Products/resident/">Raynor Genesis is a "Fylar" (Fiberglass/polyester resin) door, but only in white colonial (yech!). Raynor has very good tech information about the mechanicals of their door openers - I like their openers in particular, and a hot dip galvanized steel sandwich "Decade Showcase" (R-10+) or "Masterpiece" (R-10+, Nylon Rollers) Door makes a nice default door to measure other doors against (possibly Bronze Tone color with flush panels and no windows, or Diamond Colonial Windows). We ended up using Raynor Masterpiece doors on our attached garage and a very large Decade on the detached garage, both finished in Raynor's Clay Tone. Amarr makes Wooden Doors: the Wellington line and the Yorkshire line. Equal Door Industries, the amazing wooden doors! Cardale, British Doors - interesting developments - particularly like the Heritage and Classic lines. Boycott The Chamberlain Group and LiftMaster Garage Door Openers. They are farcically using DMCA (a stupid law) to prevent people from studying their garage door opener rolling code techniques. If they do not feel their system can stand the scrutiny, I feel their system is not worth purchasing. Wayne-Dalton DoorMaster (Torsion Drive! ), no photo-eyes needed! - but how quiet is it? Kitchen, Family Room, Master Bedroom, and Basement Doors are all in the Norco quote already. Our architect selected WeatherShield windows for most of our house, probably from the ProShield line (Vinyl clad). We decided to go with Norco instead, because of better pricing, especially on the Simulated Devided Light (SDL) design the architects came up with for our house (Norco charges by the number of 'lites' your window is devided into - since our design was simple, we could save money with their plan over the WeatherShield pricing plan). Where the window is set in either stone or siding portions of the house, we used a Sandstone color finish (02-28-5), and where the window is set in a stucco and timber frame portion of the house we used a dark Brown finish (02-4BW-7). Our Norco, representative is Randy Loren. French Swinging Doors - both can swing in. Brown (02-4BW-7) against Timber and Stucco exteriors, Sandstone (02-268-5) against the Stone exteriors, and Sandstone (02-268-5) against the Lapp Siding exteriors. Other doors and windows from Bull Run Supply, Julie Embrey. Innovative Insualtion, Inc, in particular: Super R(tm) Premium either on top of the normal cieling/attic insulation or on the outside of the house wrap and attached to the bottom of the rafters of the roof (works best with there is open air "outside" the radiant barrier. Insulation Materials: Environmental Comparisons, use recycled insulators? Cool! Environmentally Safe Products, Inc. of New Oxford, Pennsylvania, also uses recycled plastic in the foam core. It will be poured concrete basement with 9' ceilings planned (8' under ballroom), would like a double sump in series (one sump overflows into the other) with pumps in each to drain excess water outside and down-slope away from the house. I plan to alarm the second sump. We want active Radon protection installed as we hit bedrock while excavating the basement. I am most fond of electric Radiant Cove and Radiant Wallpanel heat, I experienced it firsthand in Steve LoRusso's home in upstate New York in the 1980s, and fell in love with the comfort and quiet. I have been in phone and email contact with Jim Dawson of Radiant Systems Enterprises and he is designing a bid for the heating and cooling system now. I am not the only person who wants this kind of heat, checkout this wanted ad from some poor souls in Europe. Solid State Heating makers of Enerjoy and Enerjoy People Heaters - nice underdesk unit, nice Bathroom Comfort Center, they also have Ceramic Radiant Coves, Portables, Panels, and Baseboards. Woody Hartsook of Cropp-Metcalf has laid out some interesting plans for multiple smaller air conditioning units each with several zone, a few with 2 speed motors to handle crowds while we entertain differently than the realtively small number of folks when we are alone. The more I read, the more I find out that the best comfort can be achieved through keeping both temperature and humidity within a very narrow band - sometimes our winters can be a little dry. Whole house fans are interesting, and miniducting is fascinating. Eagle Mountain, online climate control systems! Enviromaster International, manufactured in Rome, NY! A ductless split air conditioning system is one in which the indoor unit (the air handler/evaporator) is connected to the outdoor condensing unit by electrical wiring and refrigerant piping. Units may be up to 100' apart, with up to 35' of lift. A minimal three inch exterior wall opening is required to allow for the wiring and piping. EMI ductless split systems are the perfect complement to radiant heating systems. This may be the only option for the woodshop since it is a separate building... it may also (depending on how noisy the units are) be useful for multi-zoning the house. Need to find supplier and designer - want to augment with some form of LP for emergencies involving power outages only... Perhaps this can be solved using a Dual Fuel (aka: Dual Heat) system (LP Air, Ground or Water Source Heat Pump; and Electric Radiant). Radiant Cove & Wallpanel Heat, the way to go!!! Use Radiant Barriers (Foil backed fibreglass, "Foil Ray" ) for most effective insulation - keeps radiant (Summer) heat out when Sun is bright, and Radiant Heat in in the winter. Nervous about this due to inefficiencies and maintenance. Interested in "inline" or "tankless" hot water heaters for efficiency, and quick hot water to showers in widely separated parts of the house. Possibly three heaters, one in the workshop; one for the Master Bath, Laundry, Basement Bath, and Craftroom; and one for the Kitchen, Powder Room, Bar/Minikitchen, and Upstairs Bath. Rinnai America, the American division of the Japanese company that started tankless hot water heating! Waterfilm Energy, Inc, Drainwater Heat Recovery System (recovers heat in drain water to preheat water for demand/tankless water heaters) - interesting, useful where drains will usually be hot (showers, kitchen sink, tubs). Kitec is a unique multipurpose piping system that combines the very best features of metal and plastic pipes all in one. Advantages are listed, it is worth looking into - docutmentation is online. Town&Country Pools have nice looing stuff.